Of Grunge & Government: Let's Fix This Broken Democracy! 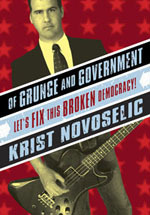 In September 2004, Krist released his first book: Of Grunge & Government: Let's Fix This Broken Democracy! The book is one part memoir, one part political platform, the bass player of Nirvana--the most heralded and influential rock band of the past twenty years--tells the story of his own musical and political coming-of-age. From his relationship to Kurt Cobain to his evolution as a political activist, Novoselic's passion, intelligence, and integrity come shining through in this moving and inspirational book. To supplement the release of his book, Krist embarked on a nationwide bookstore store to discuss his book and changing winner-take-all elections. His October 16th, 2004 talk was covered on C-SPAN's "Book TV" and conducted many interviews relating to the book and his political agenda. He discussed his book and reform options in an interview on October 8, 2004 and his tour was covered on October 11, 2004 by the New Yorker.